Week 7 saw little in the ways of injuries, but there are still plenty of players to look at on the waiver wire. As the season continues, it's more and more important to start looking towards the playoffs. Whether you need a win now or need to start stashing players, here is a list of some players that are worth a look, depending on your team's situation. 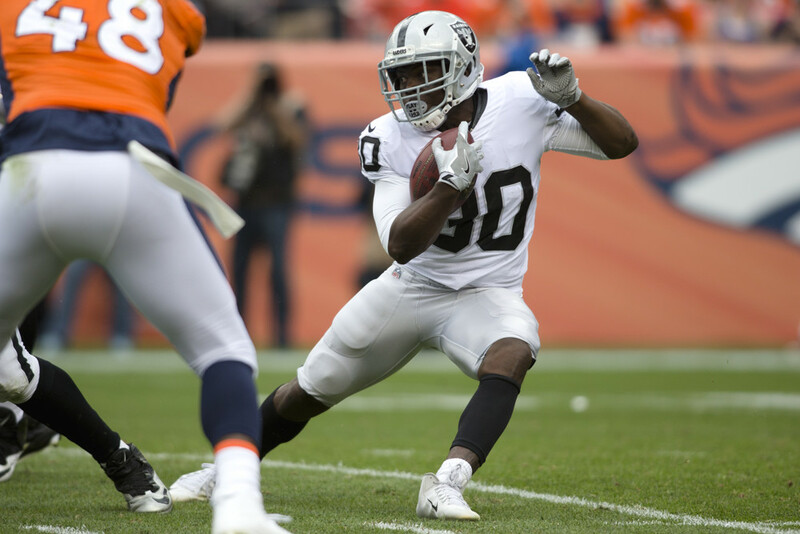 Marshawn Lynch earned a 1 game suspension by doing Marshawn Lynch things last Thursday night, so running backs Jalen Richard and DeAndre Washington will most likely split time in Week 8 against Buffalo. Richard rushed 9 times for 31 yards and caught 4 passes for 45 yards. Washington rushed 9 times for 33 yards and 1 touchdown and caught 3 passes for 7 yards. Both backs have shown promise in the past, with neither really ever fully taking advantage of situations. Both Richard and Washington can be added in 12 team leagues, but only if you are in a pinch thanks to BYEPOCALYPSE. In a must win situation, a 1 week rental might be worth the waiver spot. It seems as though a lot of fantasy owners dropped and forgot Mohamed Sanu after his Week 4 injury and Week 5 Bye. But Sanu showed how valuable he can be to the Atlanta offense, catching 6 of 10 targets for 65 yards. It didn't appear that he reinjured his hamstring, so Sanu should be locked in that offense for the rest of the season. The Falcons also have a very favorable schedule the rest of the year, with games against Dallas, Carolina, and 2 games each against New Orleans and Tampa Bay. Barring injury, Sanu should have a very solid fantasy year. Sanu can be added in 10 team leagues, and should be added in 12 team leagues. After two weeks of disappointing fantasy owners, Latavius Murray finally broke through against the Baltimore Ravens on Sunday. Murray racked up 113 yards on 18 carries and rushed for a touchdown. Murray will be in a timeshare with Jerick McKinnon, but it looks like Murray will continue to get a lot of carries (he is averaging 15 carries a game over the last 3 games). He is worth adding in 12 team leagues. Corey Davis should be another step closer to returning from a hamstring injury. Tennessee will be on Bye this week, which gives him another week to rest up. Delanie Walker was seen on crutches after suffering an ankle injury, so Davis is needed now more than ever. Davis, a rookie, had 13 targets in his first 2 games before going down with the injury. Tennessee also has a favorable schedule in the 2nd half, so Davis could have some huge games. He should be added in 12 team leagues. Robert Woods has been quietly solid in PPR leagues this season. The lowest amount of targets he has seen is 4. The last three games he has had at least 7 targets and 5 receptions. He even leads the Rams in receiving yards. All of this data points to a solid PPR option. He has yet to catch a touchdown, so there should be some positive regression after the Rams return from Bye in Week 9. Woods is a viable option with a decent floor in PPR. He should be added in 12 team leagues. The injury to DeVante Parker has allowed Kenny Stills to flourish the past two weeks, catching 13 passes for 134 yards and 3 touchdowns. Quarterback Matt Moore replaced an injured Jay Cutler, who should be out at least 1-2 weeks. Stills caught both of his touchdowns from Matt Moore, meaning the next few weeks could see a high target share for Stills. If Parker remains sidelined, Stills has decent fantasy value. He should be added in 12 team leagues, but keep an eye out for Parker news. If Parker returns, Stills is probably more of a 14 team addition. Also in Tennessee, tight end Jonnu Smith is another benefactor of the Delanie Walker injury. Smith has already been playing a majority of the snaps, but now his usage should skyrocket. There was some hype for the rookie TE coming into the season, and it looks like we will get a look at what he can do. Smith has a Bye this week, but could be a nice streaming option or Walker replacement until he returns. The Lions were on Bye this week, but have been surprisingly good this season overall. They may have allowed a lot of points to New Orleans and Atlanta, but over the season they have made up for that by getting 13 sacks, 9 interceptions, 5 fumble recoveries, and 3 defensive touchdowns. The rest of season is very favorable as well, with games against the Packers twice (with Hundley), Cleveland, Chicago twice, Minnesota, and Baltimore. All of these teams have had pretty bad offenses. This could very well be a defense that helps win your league.